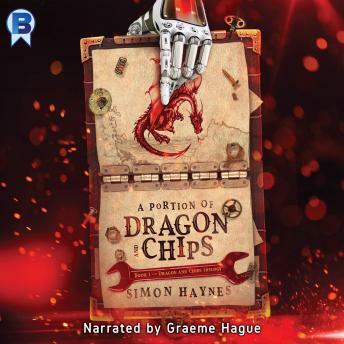 Listen to "A Portion of Dragon and Chips" on your iOS and Android device. He doesn't know who he is or where he came from. And there's nowhere to get a recharge. But fear not, because Clunk is resourceful and intelligent. He won't let marauding dragons, a bloodthirsty queen and a vengeful champion get in his way. Not even the whopping great cast of minor characters all vying to become major players. But how's Clunk going to escape this medieval madness? How's Clunk going to get home? You'll love this hilarious blend of scifi and fantasy, because Clunk is like a mild-mannered Terminator ... except even more stubborn. This is the first novel in a trilogy. Each book continues plot lines and character arcs from the previous title, with everything wrapping up in book three. They're not stand-alones!